Turbine unveiled The Lord of the Rings: Siege of Mirkwood, a new digital expansion to The Lord of the Rings Online, the 2008 MMO of the year, launching this Fall. Siege of Mirkwood will expand the online world of Middle-earth where players will join forces to press further eastward into the dark, foreboding and treacherous forest of Mirkwood and take part in the epic conclusion to Volume II of The Lord of the Rings Online. Siege of Mirkwood will be available as a digital download this Fall with an increased level cap, a new region including the legendary evil fortress of Dol Goldur, major enhancements to combat and Legendary Items and the introduction of Skirmishes, a new system where players will train customizable soldiers and take them into battle as part of the War of the Ring. * The Epic Conclusion to Volume II: Mines of Moria – Under the command of Celeborn and Galadriel, players will fight through vast armies of Orcs alongside the Elves of Lórien in a battle that will take them to Dol Guldur, the fortress of the Ringwraiths. This update includes Book 9 and the Epilogue to the sweeping epic tale begun with the award-winning Mines of Moria expansion. * Increased Level Cap — Players will be able advance their characters up to level 65, gaining access to new traits, virtues, skills and class quests. * Answer the Call of War! – Jump into the heat of battle with the new Skirmishes feature. Skirmishes offer endless action in repeatable, randomized instances where players can create and lead customizable soldiers into battle, training them to greater skill as they earn victories against the forces of shadow. Answer the call of war wherever violence erupts with the new “World Join” function that lets players and their fellowships band together to fight in various locations throughout Middle-earth. * Take up Arms! – Infiltrate the dark jails, deadly arenas and savage stables of Dol Guldur, the fortress of the Ringwraiths, and strike a blow against Sauron’s forces in new 3 and 6-player instances. Call upon your fellows to adventure into the most deadly 12-player raid yet and face the ultimate challenge – the Nazgûl Lord! 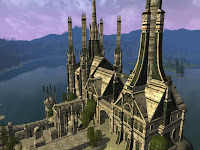 * Major Gameplay Enhancements – Turbine continues to improve the award-winning experience of LOTRO with major improvements to the combat and Legendary Items systems. Players will experience improved responsiveness when in the heat of battle. Players will also be able to create and craft their own customized Second and Third Age Legendary Items from raw materials and grow their weapons’ power to level 60. Achieve new Legacies, new titles, and a fourth Runic slot that will make Legendary Items even more unique and powerful.